One aspect of dividend investing that is very appealing to me is the consistency of dividend increases for many of the dividend champions I own. I realize how I take these raises for granted, in the rare event when a stock I own freezes or cuts distributions. Over the past week, Clorox (CLX) boosted dividends by 10.90% to 71 cents/share. This marked the 36th consecutive annual dividend increase for this dividend champion. Between 2002 and 2012, annual dividends have increased by 11.30% per year. Earnings per share increased by 11.60%/year. Check my analysis of Clorox. The current yield increased to 3.20%, which is higher than the 2.88% which 30 year US Treasury Bonds offer right now. An investor in a company like Clorox today will likely earn much more in income over the next 30 years, compared to a 30 year US Treasury Bond. As a result, fixed income allocation might not make sense for investors who look for current income. This would be driven by increases in profits over time, which would likely also result in much higher stock prices. If we experience an annual inflation of 3% over the next 30 years, an investment in Clorox with its rising dividends would essentially provide shareholders with a source of income that is relatively protected against inflation. It is no surprise that investors are rushing to purchase quality dividend stocks right now, which is pushing valuations to overvalued levels. The average estimate for 2013 earnings per share for Clorox is $4.30. The estimate for 2014 is $4.63. Based on these estimates however, I would not think it is reasonable to pay more than $86/share. For those investors who have owned Clorox for several years, such as myself however, holding on to this fine consumer goods company is a very good idea that will pay dividends for a long time. In the company’s Centennial Strategy, it targets 3 – 5% revenue growth, and profits above the rate of revenue growth. Given the company’s propensity to repurchase shares, I could easily see earnings per share growth in the high single digits for the foreseeable future. Given that the international segment is only approximately 20% of sales, I see this as a growth opportunity to expand the brand further outside the US. One concerning factor is the high dividend payout ratio of 66% for 2013. 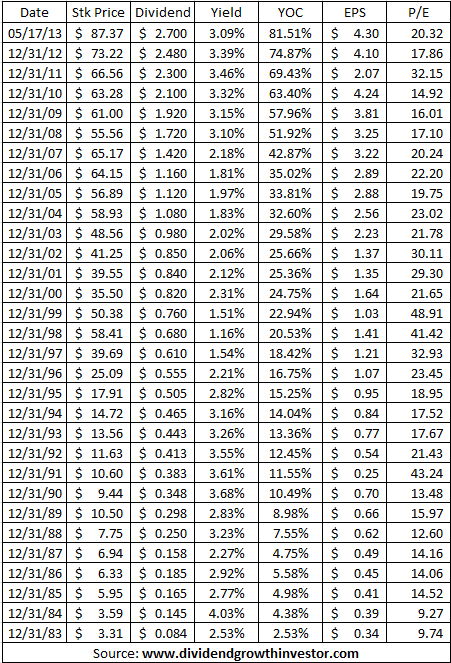 If we use 2014 forward earnings however, the dividend payout falls to 61%, which is borderline high. Over the past 30 years, investors in Clorox have done very well. The key to success had been investing at P/E ratios below 20, and holding on the position. Selling even after gains of 1000% would have been a mistake, as the company kept earning more income and kept raising dividends. While the next 30 years might not look the same as the past 30 years, this chart illustrates the power of selecting just a few quality stocks like Clorox for your dividend portfolio and then holding them for as long as possible. The data for 2013 assumes two payments at the new rate and two dividend payments at the old rate; it also assumes forward EPS projections for 2013 fiscal year.